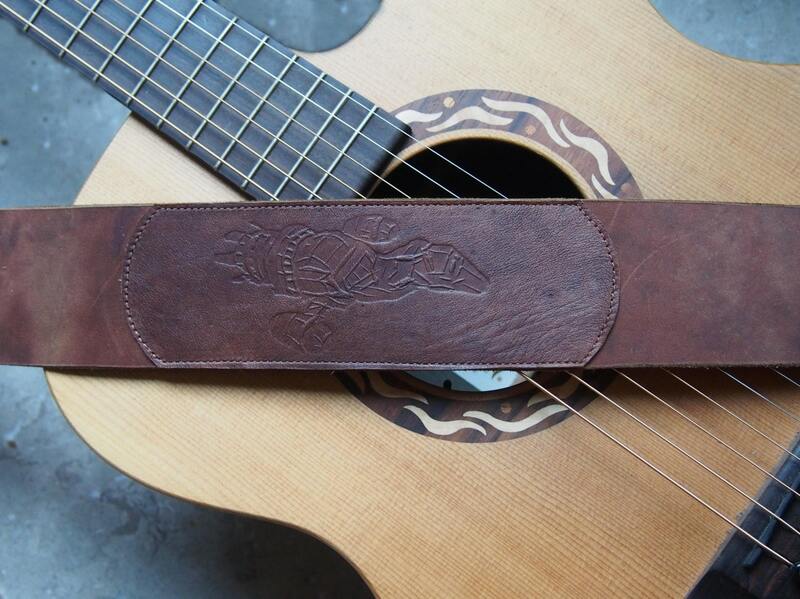 This guitar strap is made with a brownish/rust shade cowhide with an applied patch with the image of Firefly class space ship embossed on tobacco lambskin. Both leathers are similar in shade and in mottled shades of rust/brown, though the base strap is much more of a matte finish, more like a raw leather as compared to the polish on the lambskin. Note: I am out of the base leather shown for the strap, and will use as similar a hide as I can find, and may have to substitute, though I do intend to update photos ASAP once I do run out of the leather pictured. 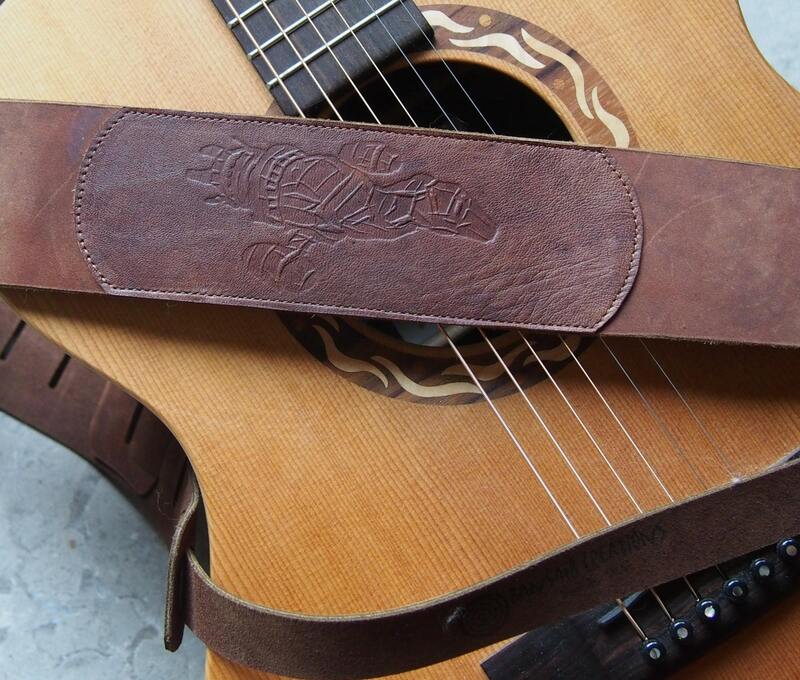 I hand carved the block and embossed the soft lambskin by hand using a ship design, and glued and stitched to the base leather, positioning close to the shoulder for most players, with the ship flying towards the guitar. The main strap is hand cut to 2 1/2" wide and tapers slightly at either end, and is about 42" long, and with the adjustment strap and the eleven adjustment slots cut about every 1", the overall length is about 48" to 60". I cut the adjustment strap to about 22", so the overall length can be adjusted from about 48" to 60" between the peg holes. This leather is just over 0.08" (2mm) thick, and firm, but will settle in with use, like all good leather does, but it will not stretch out with use! The hole for the front peg is punched at 5/16" and the back is 3/8", and a small slit ends with a small hole to prevent tears is added for a "keyhole" effect to make the strap easy to install & remove, and can accommodate most pegs, and remain securely in place. 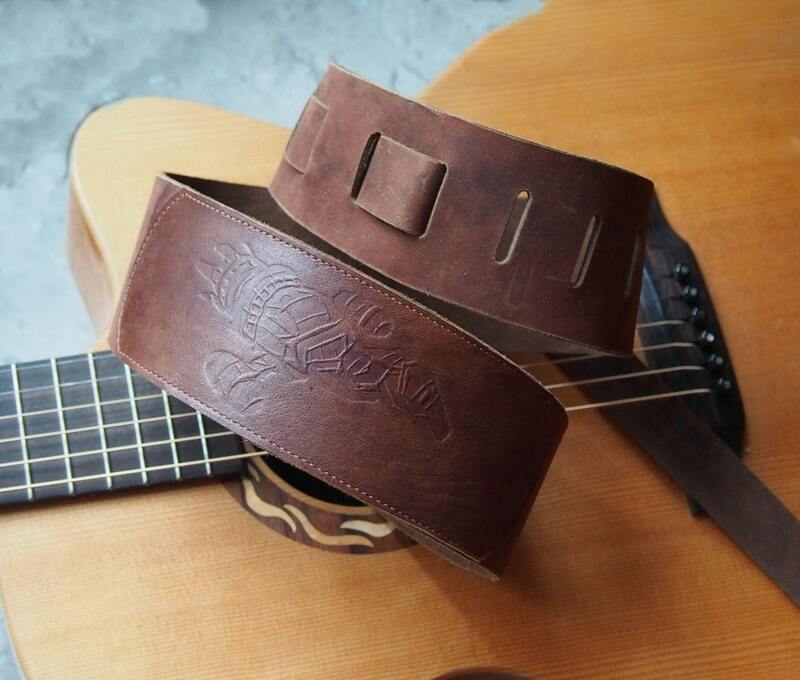 This design with the adjustment strap woven through the slots to provide the desired length means the strap is only leather, and there is no metal or plastic hardware that could annoy you while you're playing, or your knock into you instrument while it's being played, moved or stored. 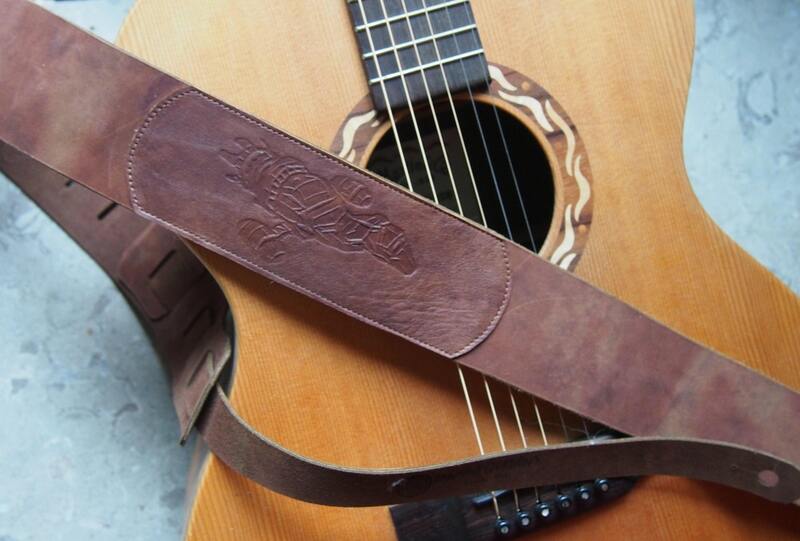 I can also provide leather "laces" if you prefer to tie the strap to the neck of the guitar, rather than using a front peg. If you have a specific peg size you need to fit, please let me know. There is no extra charge for enlarging the peg holes or for the ties when you order the strap, but please note in the order if you want any of those included. If you have any questions, please convo me! I can make this in other colors, too. The strap is beautiful and well-crafted, the embossing is accurate, and the strap fits well and is comfortable to use. Bansai8Creations made a wonderful tribute to one of my favorite shows, and shipped it quickly and securely. Thanks very much, Bansai8! I will definitely be buying again when next I need some leatherwork. Everything A-ok. Seller had great communication and even offered specialized tailoring. Thank you! Great product. Quick shipping. Exactly as pictured. Love it! Great quality, great customer service and fast shipping!